When children go to kindergarten or school, they usually have a schedule filled to the brim. Popular extracurricular activities include lessons in English, swimming, horse riding or learning to play instruments. There is no more time for many other activities or they are dependent on the weather. Holidays and a stay with children by the sea can be a great opportunity to train tennis. Tennis lessons can be taken by the sea, between lazy lounging on sand and bathing in the salty water of the Baltic Sea. Few parents are prepared to train a tennis master. And well, because trainings preparing for professional game are not only tedious, but also costly and exhausting. And yet during holidays nobody likes to get tired! Tennis for children and beginners is an opportunity to actively spend time outdoors, to jog and improve your concentration and reflex skills. It is possible and very desirable to train beginners so that the game is enjoyable. It is certainly not worth forcing a child who is not interested in tennis at all, or it is so small that it is difficult to hold the rocket. The most important thing is the joy of staying on the court and having fun! Chasing the ball must be fun and only fun motivates the youngest to work on their form, playing technique and outdoor movement. A professional trainer can organise the training in such a way that he or she is curious, changes his or her dynamics and that the child feels that he or she is not forced to do anything. 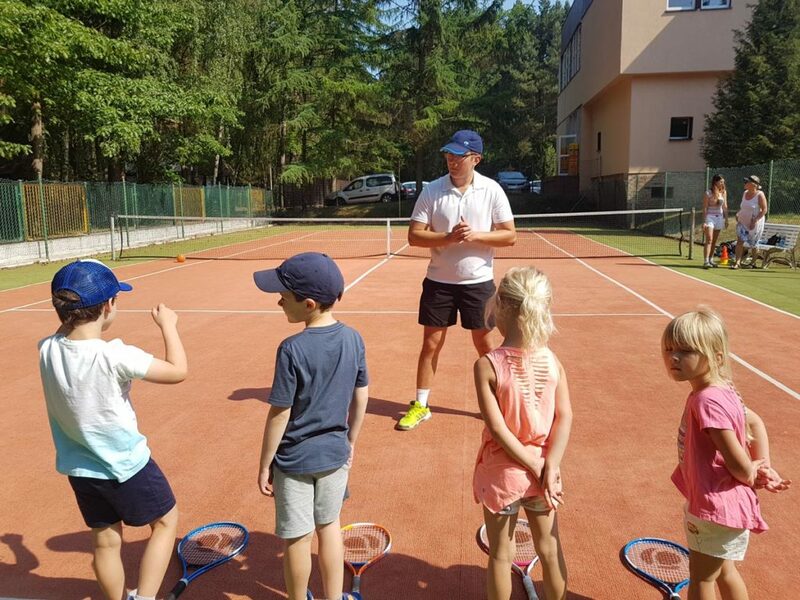 On tennis courts in Pobierowo you can play under the supervision of instructors who are prepared to conduct classes with children and adults. Tennis training for children includes an important warm-up, activities with different levels of difficulty, and is tailored to the age and condition of the child. No tennis exercises can end up with muscle pain so as not to discourage you from returning to the court. Under the supervision of an instructor it is also more difficult to get injured, and this can happen if the tennis exercises are not conducted properly. Tennis courts in Pobierowo are professional pitches with great surface. There are as many as five of them, they function until late in the evening, and because they are illuminated, they can be used by many people every day. Although tennis is considered an elite sport, it does not mean that playing tennis is expensive. One hour of using the court costs 22 PLN, and the ticket covering 10 hours of playing 170 PLN. You don’t have to buy your own rocket either. Equipment such as rockets and balls can be rented on site. It costs only 5 PLN. If you want to play in the light, an additional hour will cost 15 PLN*.